Today's suggested Pious Resolution: to get into the way of bowing your head reverently at the Holy Name of Jesus ... and at that also of His Most Holy Mother. My apologies to those of you who do this already; but my impression is that very few people do, even among the pious, even among the pious clergy. 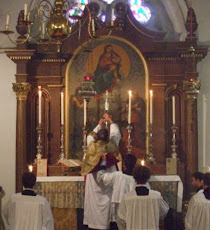 Yet bowing at the Name of Jesus is even prescribed in the old Canon Law of the Patrimonial Church of England to be done by clergy and laity alike, and this order was explicitly retained in the twentieth century revision of Canon Law. And, of course, it was laid down in the old Ritus Celebrandi Missam: 'When the Name of Jesus is named, [the celebrant] bows his head ... and similarly whenevever the Name of blessed Mary is named, or that of the Saints of whom the mass is said ...'. (Modern legislation regarding the Novus Ordo makes the same provision; I wonder how often Novus Ordo enthusiasts do so.) I try to do this, not only liturgically, but also when I hear the Name of our Saviour uttered lightly as an expletive. This is not only a matter of Law but also, surely, a decorous and attractive indication of our servitium Mariae. My wife and I do this at Mass always, and have been trying to do it at home when, reading out loud, their names are mentioned. Once this has become second nature, we will try to do it even in less formal occasions. I have made a habit of doing this since I saw a reverent priest doing it. It was actually quite satisfying to do so when I was dealing with a very foul-mouthed surgeon at my work who would frequently take our Lord's name in vain in the OR. To my question: My friend claims that when kneeling, or when saying the Rosary, it is inappropriate to bow the head at the names of J and M. Can you comment, Fr Hunwicke? I always enjoy that scene in ‘Bless me Father’ where Father mutters Our Lord’s name as an expletive in the pulpit yet still remembers to remove the biretta. I have always practiced this since I reverted back to the Church and I have to thank those wimple wearing fully habited nuns of Our Lady and St. Joseph School Canvey Island Essex for teaching me this as a child, in those happy pre-Vatican II days before the windows of the Church were opened to let in the Smoke of Satan. '275. A bow signifies reverence and honor shown to the persons themselves or to the signs that represent them. There are two kinds of bow: a bow of the head and a bow of the body. This if from an informative section entitled 'Genuflections and Bows'. Thank you, father. Bowing the head at the name of Jesus was impressed on me in primary school from 1944, and for the Trinity, certainly in secondary school, and I always do it (or intend to do it). But despite being the nerdy sort who reads computer manuals and liturgical rubrics, I have never noticed that this directive includes the name of Mary. I too, though in most other ways still far from perfection, have made these bows at the Names of Jesus and Mary, and of the Saint of the day, my practice and habit since University days (when I came back to the practice of the Faith). Interestingly, an Anglo-Catholic friend and fellow undergraduate told me that, while he had begun bowing his head not just at the Holy Name of Jesus, but also at that of His Mother Mary, discontinued doing so at the latter, since no one else at his church did. Dear Father, I began bowing the head at the name of Mary when I saw one of our Redemptorist priests doing so when celebrating Mass. Although not one to be a show-off in the pews, I have made that inclination 'religiously' ever since, hoping that fellow worshippers will follow suit. Not much success, though, so far. I should add that our shrine to Our Lady of Perpetual Succour is very well patronised, and that many graces have been obtained from praying there to the Blessed Mother. At Holy Mass yesterday the PP mentioned that in the flagship public sector RC school in Scotland, to which he is the chaplain, with a roll of over 18OO, only one pupil was called Mary. Hopefully, the lone Mary and her family celebrated our heavenly mothers great feast with joy unbounded. Many thanks to E sapelion in his comment above, who reminded us of the most important of these bows - that at the naming of the Three Persons of the Trinity. For some odd reason, sometimes pious Catholics cross themselves at the Glory be, but they ought rather devoutly to bow their heads. I recall reading of a holy nun who, each time she bowed at the Gloria Patri, pictured her head laid on the chopping block, as if she were to be martyred for her maintaining of our holy Trinitarian faith. How pleasingly Baroque! The Catholic Churches who use the Byzantine Rite have the rubric that any time the Persons of The Trinity are mentioned one should cross oneself.